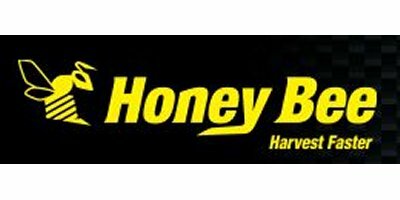 HoneyBee - Grain Belt Header by Honey Bee Manufacturing Ltd.
With low maintenance features including an oversized oil cooling reservoir and heavy duty 3/16' (.48 cm) tubular steel header mainframe, the Grain Belt Header is designed to last. Add in our reputation for well-built, dependable equipment and you’ll have a lot more harvest time on your hands. The Honey Bee Grain Belt Header improves combine efficiency by eliminating the twisting and tangling problems of conventional auger headers that result in poor combine performance, higher fuel costs and lower grain quality. Using drapers and a unique feed auger, the Honey Bee Grain Belt Header uniformly feeds the crop heads first into the combine, providing constant harvest speeds, superior threshing and less down time. Depending on the crop, you can increase combine capacity by as much as 20 percent. The Grain Belt Header not only ensures proper feeding of cereal crops, but also dramatically improves feeding of bulky crops like peas and mustard. New hydraulic header tilt adjustment equipped with ball and socket on both ends improves header floatation. All Honey Bee headers come equipped with o-ring face seal hydraulic fittings to prevent oil leaks. Adjustment to cutting height is now a breeze – simply pull a pin and push a lever. In addition, floatation has been increased to eight inches. The new “Raptor” drapers are made of heavy duty, longer-lasting, rubberized polyester with fibreglass reinforced slats and tie bar connectors for extended draper life. The ‘v’ guided drapers are a standard 42' (106.7 cm) width. The Honey Bee cutter height is now the lowest in the industry. In addition the profile has been changed to reduce the height the crop has to move from the knife to the draper by 50%. Draper speeds are hydraulically controlled and adjustable. The new hydraulic system reduces oil pressure drop and oil temperature. Independent control over the drapers gives you the power to move heavy material smoothly and efficiently. Highest quality, heavy-duty drive shafts give long-lasting trouble free performance. The redesigned gear box is now lubricated with gear oil (not hydraulic oil), which decreases the overall hydraulic oil system temperature by up to 100° F.
New ball and socket design is longer-lasting, easier and less expensive to maintain as the wearing part (the ball) can be replaced separately. Improved crop divider flows seamlessly through the heaviest of crops, reducing crop trampling. Four inches of vertical adjustment gives you maximum flexibility. Extremely fine adjustments are now possible through a nut and threaded rod system. UHMW skid plates are standard on all models to protect the cutterbar when cutting crops close to the ground. The new low profile clips eliminate dozing. The header has excellent floatation and ground hugging capability. Lateral and vertical leaf spring suspension allows the header to float independently of the combine’s OEM accumulator floatation system. You’ll put more crop through the combine, leave less in the field, and reduce rock damage to your cutting system. No-wrench tilt adjustment allows you to set the platform at the best angle to perform in all crops – short, tall, bulky or sparse. The canvas can be adjusted for tracking and tightening, which allows even tension on both the front and rear of the rollers. A quick release lever allows for ease of canvas and roller cleaning. A slip clutch on the feed auger disengages to prevent damage caused by foreign material running through the combine. The 3' (7.6 cm) diameter drive rollers provide traction in heavy crop conditions. Powered from the outside by a hydraulic motor, the drapers move the crop towards the centre for more uniform feeding. Fasten your seat belt. The 68' (172.7 cm) centre deck combined with the 72' (182.9 cm) feed auger with retractable fingers smoothly feeds the crop into the feeder housing without twisting or tangling. A hinged door under the centre deck allows easy cleaning of foreign material like rocks and roots that might jam the feeder. The independent hydraulic system allows you to easily fit the Grain Belt Header to any combine. If you change combines, you can switch the header to the new combine simply by changing the adapter. A PTO driveline powers two hydraulic pumps which are mounted to a gear box that drives the feed auger. The gear box is lubricated with gear oil. A hydraulic adjustment with in-cab control is available for fore/aft positioning for on-the-go response to changing crop conditions with a 16' operating range. The knife is driven by a 3 5/16' (8.4 cm) stroke, epicyclic knife drive which ranges from 1,284 – 1,400 strokes per minute (depending on make of combine), eliminating fore/aft movement. The knife drive is driven by a low maintenance hydraulic drive motor. Optional double knife drive systems are available. The SCH Easy Cut Cutting System provides smooth, superior cutting. Spring steel guards, with cutting edges on top and bottom, along with alternating, bolted, heat treated sections, eliminate the need for hold downs. The system keeps dirt and debris from accumulating under the knives for increased performance in severe cutting conditions. Allows for easy towing of your combine header behind a pickup truck or combine. Easily transport your header through gates and down narrow roads. Hydraulic drive cross augers assist in material flow from the drapers to the feed auger. The auger is adjustable to match varying crop conditions and increases combine capacity in bulky crops like peas and mustard. Augers are ‘size’ specific. Hitch, jack and axle combination allow header to be stored and transported when not in use. The self contained integral transport including hitch, jack and axle are conveniently stored on the header table. Honey Bee`s AirFLEX from Honey Bee is the clear-cut choice for faster harvests. Its flexible cutterbar allows it to pick up low podded crops (like soybeans and pulses) capturing more of the crop, at speeds never seen before. Honey Bee`s Jamie Pegg takes us through the new AirFlex draper header at Agri-Trade in Red Deer, Alberta. No reviews were found for HoneyBee - Grain Belt Header. Be the first to review!